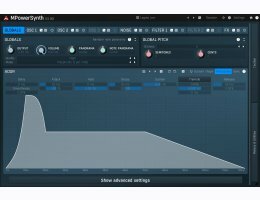 MPowerSynth is an extremely versatile synthesizer featuring the best sounding oscillators on the market, the most advanced distorting filters and a unique modular effects engine. It also features a smart randomization system providing endless inspiration! MPowerSynth comes with over 1500 community-designed presets, post-processed to get the highest possible quality. Each preset features at least 4 macro controls, automatically assigned to standard MIDI controllers such as modulation wheel or expression pedal. This means an inexhaustible set of leads, pads, basses, effects and much more... And if you run out of inspiration or simply want something really new, the ground-breaking smart randomization engine will let you create literally an infinite number of sounds (if you have enough time).